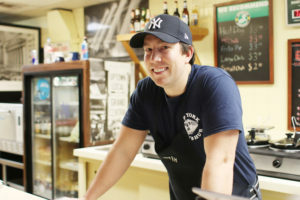 Hunter Christiansen, the owner of New York Sub Hub on Avenue C, grew up in the restaurant that his dad started in 1979. Christiansen has worked at the family-owned sandwich shop since he was 10 years old, or as he puts it, since he could hold a rag. As he enters his seventh year of ownership, the legacy of the shop his father opened, along with several other businesses along Avenue C, could be interrupted due to UNT’s Board of Regents’ vote to exercise eminent domain on the businesses. UNT has not disclosed a specific plan for the proposed acquisitions. New York Sub Hub owner Hunter Christiansen works behind the counter at his Avenue C restaurant on Feb. 7, 2019. Image by: Meredith Holser. Christiansen said he found out about the eminent domain vote through a story in the Denton Record-Chronicle. He said it is unfortunate that the university has not taken New York Sub Hub’s 40 years in business into consideration and reached out to him, but he does think that establishing communication between the business and the school would make the situation better. 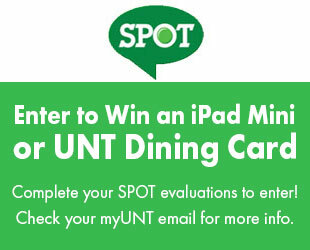 Although the Board of Regents has not been in contact with the restaurant yet, Christiansen said he has a deep connection to the students and culture of UNT. Students employed by New York Sub Hub over the years have become friends and Christiansen has even gone to some of their weddings. Psychology senior Baylee Davis, an intern and band member at the Denton Wesley Foundation, has eaten at New York Sub Hub with the rest of the band, after their worship session every Tuesday, for the past four years. Davis also helped the “Sub Hub Challenge,” which rewards anyone who eats all 33 available sandwiches within a month. If someone complete the challenge, their name is added to a plaque in the restaurant. The employees at New York Sub Hub have the band members’ orders memorized and have gotten to know each of them. New York Subhub sits near the intersection of Avenue C and Eagle Drive. New York Subhub has operated at its current location since 1979. Image by: Will Baldwin. Music sophomore Michael Rogers, a member of the Green Brigade, is a regular customer of New York Sub Hub, which is a “wonderful place,” he said. He enjoys the sandwiches so much that he recently completed the “Sub Hub” challenge created by Davis and her friends. 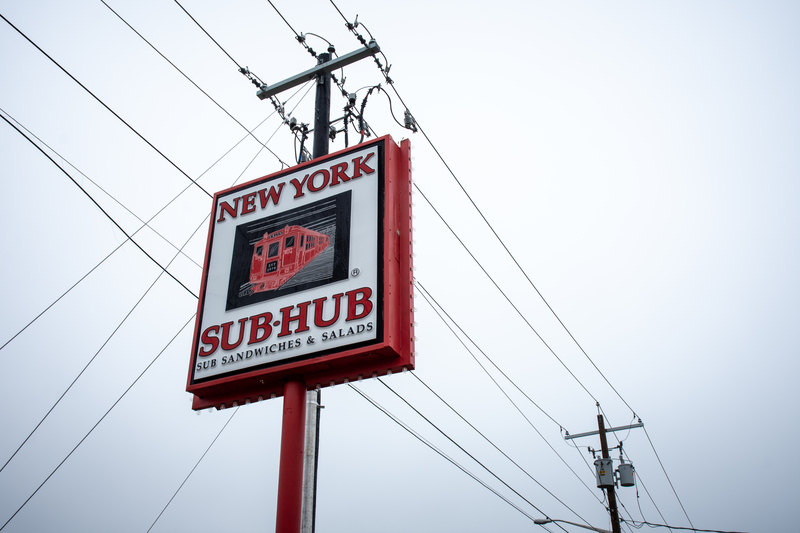 The amount of support the restaurant has received has been overwhelming for Christiansen, who said he cannot understand why the university would want the spot that New York Sub Hub is in. In response to the Board of Regents vote, there have been mentions on Twitter of staging a protest in support of the restaurant, as well as other tweets expressing how much people enjoy Sub Hub. Christiansen has noticed the positivity online and thinks the university should take note of the number of people supporting him and the rest of the staff. For Christiansen, UNT exercising eminent domain on New York Sub Hub would be interfering with a family legacy and part of the Denton community. 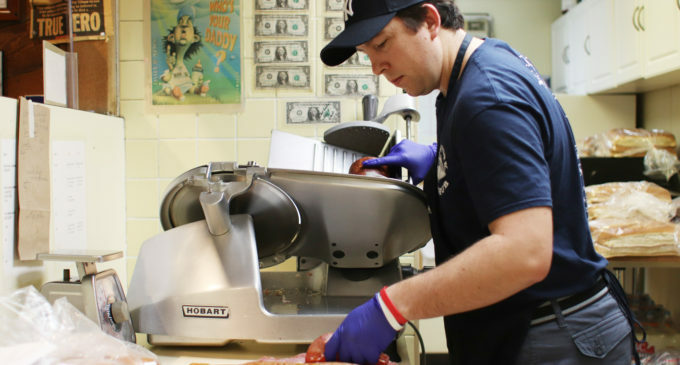 Featured Image: New York Sub Hub owner Hunter Christiansen slices meat for a sandwich at his business on Feb. 7, 2019. Christiansen grew up in the restaurant, started by his father in 1979. Image by: Meredith Holser.